Inspired by exquisite nature prints, our Artisan Luggage Organizer (8pc set) is a travel essential that combines gorgeous designs, lasting quality and convenient functionality. 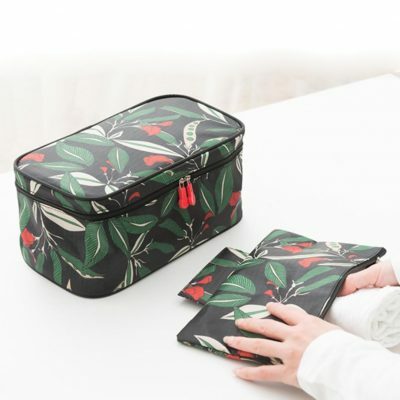 It features a 8-piece set that is perfect for organizing clothes, undergarments, beauty accessories and other travel must-haves. Organize and maximise your luggage space today! What beats having a neat and space-efficient luggage? Light and durable, our 6-piece Classic Luggage Organizer keeps your luggage well-organized so that you will be able to pack more for your holiday! Coming in 9 amazing colours, choose your favourite one and bring it along for your next trip! Remove cotton balls and dust from clothing and linen surfaces easily with our Compact Lint Roller! Well-designed and portable, it features an ergonomic handle and a protective cover. Keep your outfit dust-free easily today! Love floral prints? If so, you will love our exquisitely designed Le Fleur Luggage Organizer Set! Its name translates to “The Flowers” in French and it is easy to see why! Made with quality splash-proof materials, you get a sense of craftsmanship with this organizer. Moreover, it comes with 6 unique packing organizers to keep your luggage neat and tidy. Bring along this premium and timeless organizer on your next trip today! Whether you are heading for a quick get-away or your much-awaited holiday, organizing your undergarments is surely a good start to the vacation! With our Le Fleur Undergarment Organizer, you may now keep you undergarments, bras and swim wear neat & tidy – all by using just one pouch! It features unique detachable storage layer for added space and hygiene. Bring this along and be organized for the perfect trip! Cute and functional are the best words to describe our Round Undergarment Organizer! 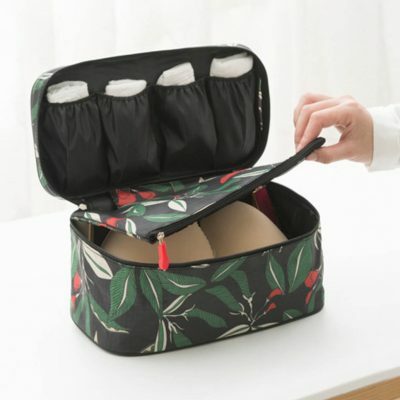 With a simplistic yet unique design, this organizer is perfect for storing away your undergarments, bras, swimwear, menstrual pads and more! With plenty of pockets and a spacious interior, say good-bye to unsightly and unhygienic plastic bags! Sleek and well-made, The Modern Luggage Organizer (6pc Set) is an all-in-one bundle for you to travel in style! It features clothes organizers with straps to secure your tops and bottoms, allowing them to stay crease-free. Besides, the set comes with a handy mini pouch, an undergarment holder and a drawstring bag for you to organize your travel essentials effortlessly!